Tweak says, "I'm gonna get my drink on"
[Another bright day in Miracle Country, where everything is calm and quiet and... colorful? Not just pink this time, either. It'll be hard not to notice that something's different, even from simply looking outside each house's windows. Outside, it's a jungle. A plastic one! Slides, rainbow-colored net bridges or tunnels connecting different buildings, or treetops, or the many maze-like structures that have been magically put up during the night. 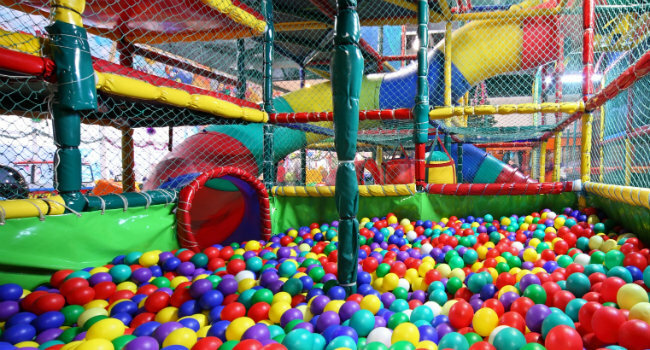 And all around, ball pits, massive ones full of little colorful plastic balls to swim in, or struggle to get out of. It seems simple enough, right? Climb through the ladders and bridges, slide down the slides, and reach your usual destination... Well, some of the bridges may vanish now and then, leaving you to fall to your colorful, plastic-y doom. There are false steps on some of the ladders that'll cause the same results. Sometimes you'll find yourself taking a wrong step and falling down a slide that you could swear wasn't even there before. Even the usual comfort of the underground seems at risk, given that it's possible to take a wrong step or turn there and find yourself going down a slide... that might lead to another end of the islands entirely. Basically, you're very likely to get lost, confused, and frustrated... Or have a ton of fun jumping from here to there in this magical game, especially once you notice not all the plastic balls are the same! Some are squishy like stress balls, some might be large bubblegum, others might have effects like tickling the people touching them, and so on. Now, for those who aren't so keen on it, don't despair - some of the ballpits are set with things like picnic baskets, or even pillows - maybe just grab a snack, or rest from a tiresome day of playing around. Some of the bridges and tunnels going across the trees of the various islands lead to little treehouses where you can catch a break, as well. And should you be stuck out there even through the night, you'll notice that the different plastic balls start to glow, helping with visibility. And yet you still give me that look. I have a feeling you're quite used to that look. The Detective uses it a lot. What do you mean, "of course"?